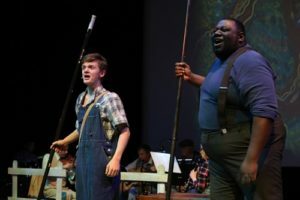 Music Theatre Kansas City teamed with The Black Repertory Theatre Company and founder Damron Russel Armstrong to feature a composite cast of young thespians along side some seasoned professionals in a re-telling of “The Adventures of Huckleberry Finn,” the Mark Twain classic. 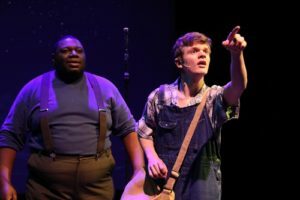 Set to music by “King of the Road” composer/performer, Roger Miller, the score reflects his wit, wisdom, and farcical tendencies in a charming production that cuts many of Huck’s adventures but still tells the story of the celebrated novel. 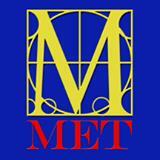 The Broadway musical ran over 1,000 performances in its initial production. 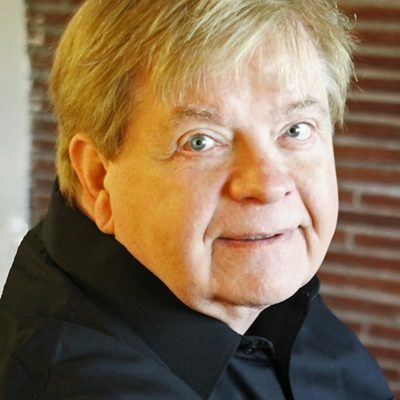 The show captured seven of ten Tony Awards for the 1985 season. MTKC continued its format of producing a show on a short schedule with giving the cast a script and then producing a show in a short time frame. According to Julie Danielson, rehearsals began March 8 with the opening performance on March 16, so they had one week to rehearse. 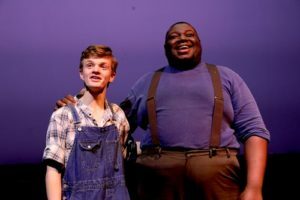 Ryan Jacobs and De’Markcus Howell as Huck and Jim carry the show and provide the focus. Rob Hallifax bring the sleazy character of Pap to life with his strong portrayal. And the second half comedy comes from the conniving tandem of the Duke and The King as played by Jason Torrey and Zak Smith. “Roles were assigned in early February and the cast was expected to work on their lines and solos ahead of time. All ensemble music and choreography was learned during the rehearsal week as well as scene work,” Danielson said. 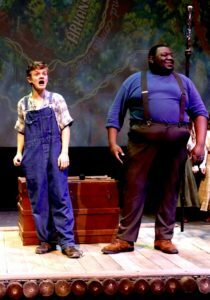 “Big River” puts a lot of talent on the stage and gives budding actors a chance to work along side more seasoned actors from the KC Metro area. The combination gives a strong opportunity for young actors to see how others perform and create characters. The show is fun, fast paced, and melodic. Only three performances remain March 22-24. Tickets can be purchased through the MTKC website. Performances are at the B & B Theaters at Midland Drive and I-435. Check the website for times and ticketing. The cast is: Ryan Jacobs, De’Markcus Howell, Maddox Bane, Grace Hawkins, Zak Smith, Jason Torrey, Melba Wright, Sheriece Veazey-McNally, Rob Hallifax, Alyson Golladay, Callie Rodina, Victor Castillo, Carol Leighton, Matt Wine, Abbey Downs, Michael Pandzik, Gracie Wright, Anna Avery, Elise Bowles, Peter Dessert, Jacob Wray, Hank Burvee, Terrace Wyatt, Jr, James Hawkins, Dreyson Hill, Maggie Bunch, Tessa Brethowr, M’racle Bryant-Morgan, Kimberly Gibson, Tori Wyatt, Gavin Hoedl, Eric Wright, Ashtin Umstattd, Charity Harris, Eli Huber, Hank Danielson, Gerald Smith, Jr., Jonah Cartwright, Lake Sowles, Lizzie Hoedl, Michal Lackey, Natalie Policky, Raheem Fielder-Bey, Tripp Starr. The orchestra is: Julie Danielson, conductor/keyboards; Chris Clements, acoustic guitar/banjo; Jonathan Schriock, violin/fiddle; Debbie Allen, Flute/clarinet, bass clarinet/soprano sax; Jim Funderburke, harmonica; Evangelina Letour, upright bass; Kevin Pham, drums. 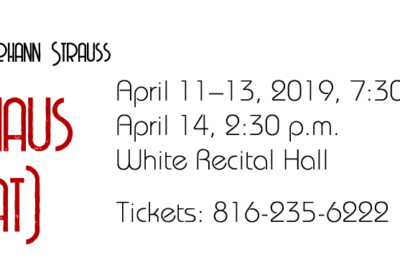 Waters, choreographer; Laura Jacobs, stage manager; Jamie Leonard, lighting designer; Maddie Rowe, sound designer; Nancy Schnegelberger, props; Trevor Rodgers, tech assistant; Jake Elliott, production assistant.